Aaron Paul was just going on about how he misses playing Jesse Pinkman. Well, he gets a bit of a Breaking Bad fix here by reuniting with Bryan Cranston for this amusing comedic short from Audi for next Monday's Emmy Awards. 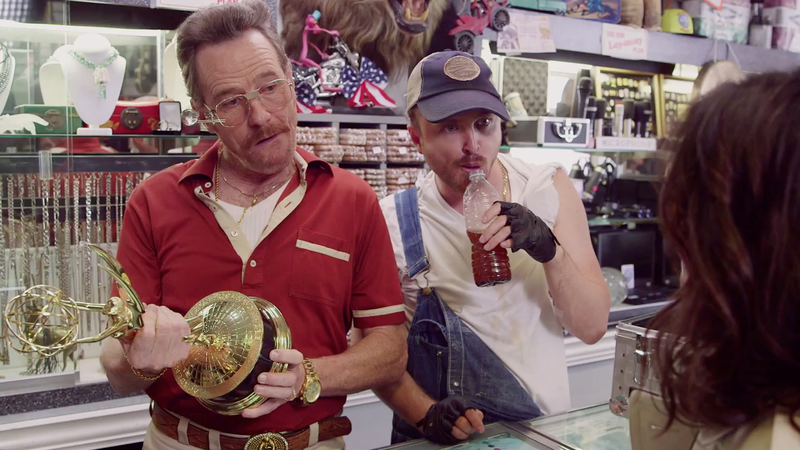 Cranston and Paul once again play colleagues in a sketchy trade, though this time, instead of cooking blue meth, they're running a pawn shop together. The video also stars Julia Louis-Dreyfus—that makes three Emmy winners—who tries to pawn her 1996 Emmy (for playing Elaine on Seinfeld) to help pay for a private island she's bought in a fit of Celine Dion envy. The video was produced by PMK-BNC and written and directed by Paulilu (the comedy team behind Dollar Shave Club's viral launch video as well as last year's great Spock vs. Spock ad for Audi with Zachary Quinto and Leonard Nimoy). "We knew we had a great concept, a winning team and a client, Audi, who understood the value of this type of content," says Joseph Assad, executive producer at PMK-BNC. "We flew in the face of convention by putting out a video at six minutes, but with the high-caliber acting and the quality of the idea, we knew we could push some boundaries." The whole thing is pretty hilarious—particularly the sly nod to Walter White and Mr. Pinkman at the end. UPDATE: Were the creators perhaps inspired by an actual episode of Pawn Stars Las Vegas in which a guy tries to sell a Grammy Award?